My Grandpa was over for his weekly dinner and brought over an apple pie for dessert. While eating it we started talking about how much we can't wait to eat a rhubarb pie. I mean, I love rhubarb pie. I purchased the pre-made ones from our local grocery store every year about this time when they start selling them. 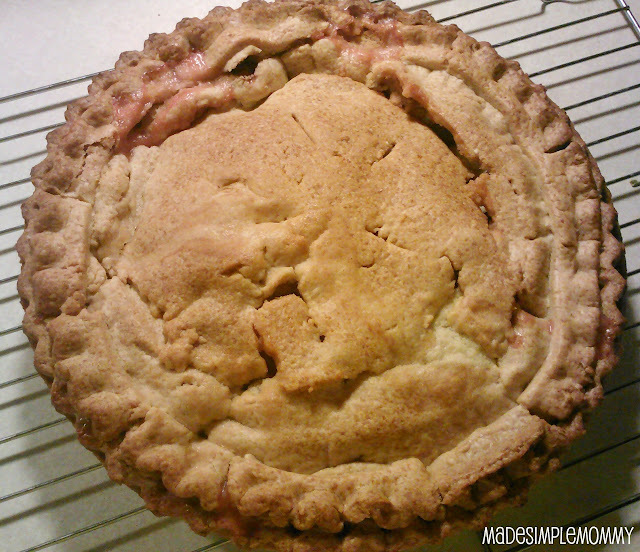 Rhubarb is typically the first fruit (or vegetable) to get ripe in the spring and can be used for baking and canning. I have never baked with it before. My Grandma always used to make pies. Well we were talking about how great a rhubarb pie would be...and then my Grandpa left and I kept thinking about the tasty red stalks that my Grandma used to chop out of the yard in the house I lived in with my Dad when I was little. 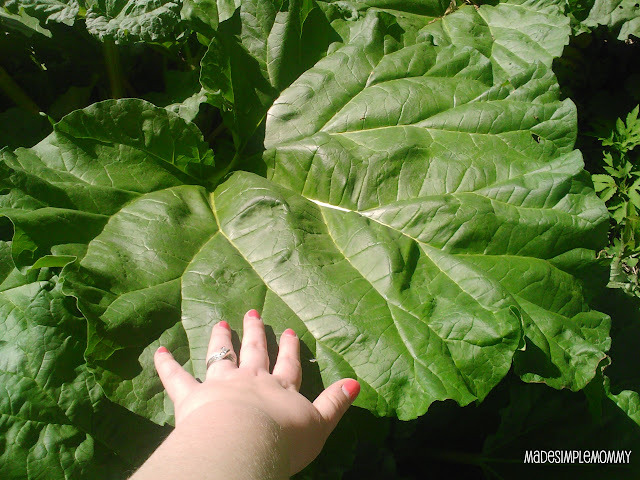 There is a rhubarb patch in my backyard!!! I announced this on facebook as being the longest and biggest blonde moment of my entire life. We have lived here for eight, count them 8 years. I remember my husband hacking away at it thinking it was a weed several years ago...but we still have it. I immediately grabbed some kitchen shears and headed out to cut me some fresh fruit from my own yard! Rhubarb leaves are poisonous to people. I remember my Grandma telling me this frequently. I cut them off and washed the stalks happily. I called my Grandpa to tell him the news. He'd be having a rhubarb pie soon! I then dug through my recipe box of my Grandma's recipes that I copied and got to work. 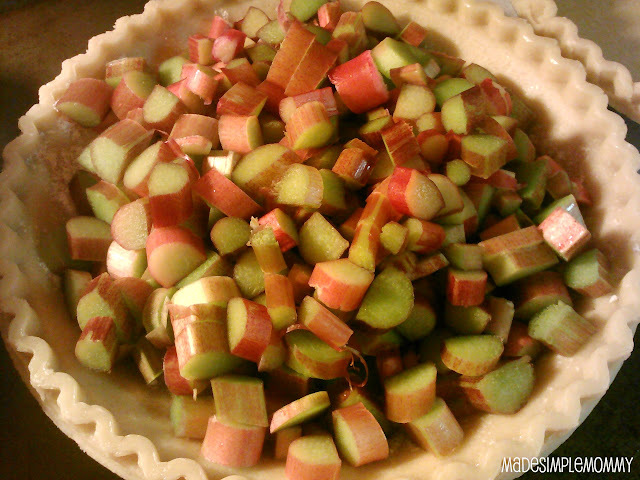 This is a very simple recipe that makes a tart pie, and do not mix the sugar with the rhubarb, otherwise it will be watery at the bottom. Combine the sugar and flour in a small bowl. Sprinkle 1/3 cup of the sugar and flour mixture over the bottom of crust. Place rhubarb over the sugar layer. Pour the remaining sugar/flour mixture over the rhubarb. 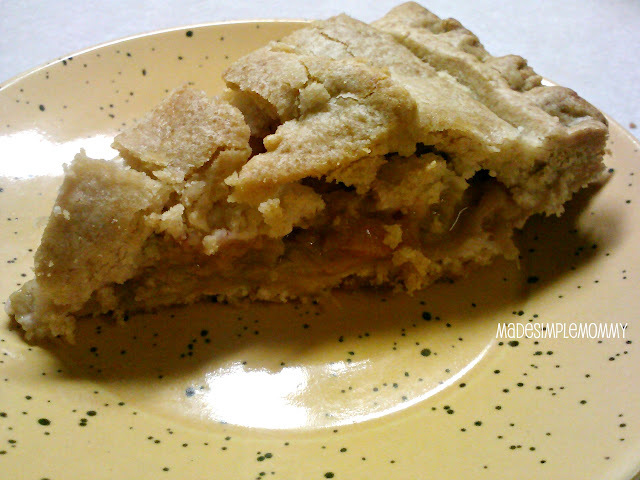 Top with other pie crust, cut slits for steam. Bake on lowest rack in oven on a cookie sheet for 15 minutes.